Vincent Van Gogh. Starry Night. 1889. Saint-Remy, Provence, France. Oil on Canvas. Those who have known me since my teenage years, know what a HUGE influence he was on me starting to paint. As I continue to be fascinated by physics, staring at nature and reducing it to basic geometric patterns, “movement, fluid and light” in my mind’s eye, it turns out that even bona fide physicists and mathematicians are fascinated with Starry Nights, as well as his other works. Supposedly, his paintings come close to a mathematically accurate depiction of turbulence, a phenomenon that physicists and mathematicians are still struggling to define, as explained in this fascinating video. I wish he had lived long enough to see that his brilliance was recognized, and the huge influence he had on artists (and scientists!) for generations to come. Here is a copy of his portrait I had made as a teenager. Unfortunately, I don’t have the original painting. Like many others, this, too, was misplaced during my many moves. An homage to Vincent Van Gogh. Aditi Raychoudhury. Study For “Portrait of Vincent Van Gogh (with Candles)”. 2008. Chalk Pastels and Charcoal on Newsprint. 18″ x 24″. Fascinating 10 things you may not have known about this great man. Song of the Sea – You make my eyes hurt! You are so achingly beautiful – my eyes hurt from blinking in disbelief! For those with kids (or not) – See this masterwork from Cartoon Saloon by director Tomm Moore! If you are lucky enough to have it playing at a theater near you! Its playing at the New Parkway Theater in Oakland tonight! With pay what you want, and 20% being donated to local nonprofits, for a movie so gorgeous- you just can’t go wrong! Tomm Moore. Adrien Merigeau. Song of the Sea. 2014. “Hand-drawn animation increasingly seems like a dying artform — at least in the US. Here, studios like Pixar and Dreamworks make their films using computer-generated animation. And even if some of these films are among the best animated films of all time, there’s something sad about the loss of the handmade beauty and intimacy of the best two-dimensional animation. Fortunately for fans of these films, they’re still being made in other corners of the world, and a studio named GKIDS (which stands for Guerrilla Kids International Distribution Syndicate) has been importing them to American shores and finding success on the arthouse circuit, as well as at the Oscars. The studio has quietly made inroads on the Best Animated Feature category, getting six nominations in less than a decade. Two of those nominations have arrived this year, for The Tale of Princess Kaguya and the absolutely gorgeous Song of the Sea. For more gorgeous scenes, go to Vox. Press Release for the Song of the Sea. (Belated) Happy Birthday Dr. Seuss! And, now to the (not-so) secret art of the genius! Like so many of you, I, too, am a big fan of Dr. Seuss. So, I was very excited to see INGENIOUS! THE WORLD OF DR. SEUSS at the SAN DIEGO HISTORY CENTER this past winter. Here are a few of my favorite rooms and paintings from the show. The postcard room included make your own postcard with a message of cheer, which, you could drop into the canvas bag. These postcards would be mailed to children without families. Postcard Room. Ingenious! The World of Dr. Seuss. 2014. San Diego History Center. The Lorax Room. Ingenious! The World of Dr. Seuss. 2014. San Diego History Center. Reading Room. Ingenious! The World of Dr. Seuss. 2014. San Diego History Center. Dr. Seuss. I Dreamed I Was a Doorman at the Hotel del Coronado. 1970. Acrylic on Canvas. Dr. Seuss. The Joyous Leaping of Uncanned Salmon. Acrylic on Canvas Board. Dr. Seuss. Joseph Katz and His Coat of Many Colors. 1970. Acrylic on canvas board. Dr. Seuss. Worm Burning Bright in the Forest in the Night. 1969. Oil on illustration board. Dr. Seuss. Green Cat with Lights. Original oil on illustration board. Dr. Seuss. Cat Detective in the Wrong Part of Town. 1969. Pencil and watercolor on illustration board. Oh dear! I can’t stop here is the last one – and i leave you to browse more of his brilliance on the Art of Dr.Seuss. Dr. Suess. Surly Cat Being Ejected.Gouache and enamel on illustration board. I am in complete utter shock since I heard about Rex Ray‘s passing yesterday. I had poured over his work a few years ago to develop my own sketches, some of which, eventually became trees for a poster I had designed to support the “Vote the Environment” campaign right before the 2014 mid-term elections. No doubt that his work will continue to influence me and others. Rest in peace, brave artist. Rex Ray. Cocobolo. Mixed Media. Rex Ray. Cyphellae. 2005. Mixed Media. R.K. Laxman, Indian cartoonist, and satirist extraordinaire died today at age 93, after a life well-lived. My childhood was much enriched by his mind-expaning cartoons about corruption, politics, and the absurdity and hypocrisy of our lot. He made (some of) us want a better world. Rest in peace, beloved artist. R.K. Laxman. Pen and Ink. Joe Sacco. Limits of Satire. Published in the Guardian, January 9th, 2015. And while we are at it, another nuanced article by Teju Cole from the New Yorker, about who we choose to mourn and why? Who we call terrorists and who we don’t, even when the casualties are innocent? CREDIT PHOTOGRAPH BY DURSUN AYDEMIR / ANADOLU / GETTY. 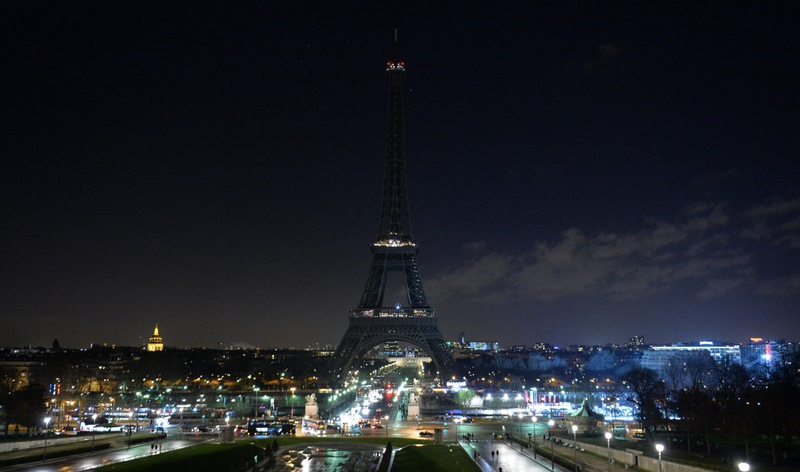 The Eiffel Tower after its lights were shut off in memory of the victims of the attack on Charlie Hebdo; January 8, 2015. Published in the New yorker, on January 9th, 2015. I am was going to post my thoughts on the distinctions between free speech and responsible speech, and Islamist extremism and Islamophobia, soon after the attacks happened. But, Joe Sacco and Teju Cole, made my life easier by saying everything I wanted to say, far more brilliantly, than I could have. I am posting this on a wider forum, because, when I expressed my thoughts on Facebook about using the massacre to dig deeper on the responsibilities that come with free speech, and to think about why the world is the way it is today, I was accused of justifying what happened, which, I am not. The irony of the defenders of free speech asking me to shut up, wasn’t lost on me. I hope that these articles will help form us a wider narrative of the world, every single day that the world is being polarized by our shameless media conglomerates, because the truth, is that a deeper understanding of our constantly, shifting and changing, and largely, gray world, will guarantee more security and safety for all of us – not calls for Jihad, nor the calls to bomb places “back to the stone age”, and certainly not by turning our backs on the atrocities perpetuated by our own governments on its people, and innocents elsewhere. Bob Staake. Broken Arch, New Yorker Cover. 2014. I love Bob Staake’s work! This iconic image (and many others) he has done comes from an incredibly refined mind and thought process. In his words, “I try to find a way to really, really boil down and distill a big, complex issue into the most simple image that I possibly can. The simpler the better. And it’s difficult to do.” Difficult is putting it mildly – very few can simplify complex issues the way Staake does – his interview is very informative about both racial divide and how his iconic covers come about. Thank you #BobStaake for your brilliance! Bob Staake. Signs of the Times Square. 2014. Bob Staake. Think Small, not Mall. Isao Takahata for Studio Ghibli. The Tale of Princess Kaguya. 2014. I am heart-broken that Studio Ghibli’s The Tale of Princess Kaguya has left my local theater. I have not been able to stop thinking about it since I saw it last week. I wanted to see it at least a couple more times. Yes, I am really really really heart broken that its gone! I had read Yasunari’s version of the more than ancient “Tale of the Bamboo Cutter” years ago, and I have to say that much as I am a sucker for Yasunari Kawabata, I am a bigger sucker for this movie. Watch it if it ever makes it to your hometown! The New York Times best illustrated books for 2014 is out! Its really hard to pick a favorite (or two), because they are ALL so AMAZING! – but I think these are mine. Would love to know which ones made your list! Raúl Colón. Draw! 2014. Simon & Schuster. Peter Sís. The Pilot and the Little Prince: The Life of Antoine de Saint-Exupéry. 2014. Farrar, Straus and Giroux.